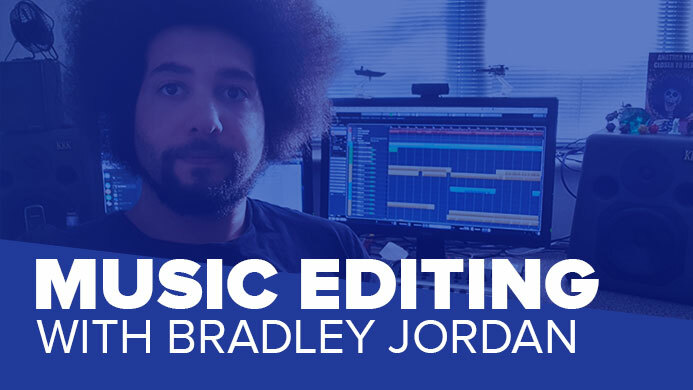 I recently sat down for an interview with ThinkSpace tutor and professional music editor Bradley Jordan for some inside information on the life of a music editor. To me, music editing is a shortcut to doing the scores for the TV shows and films we score. So traditionally the composer would get the episode and they would score it start to finish. They would then move onto the next episode to do the same, and so on and so on for the rest of the series. Instead of that, Guy will get anywhere from 8-12 episodes into the series, then I would get the grouped, exported stems (strings, brass, woodwinds etc). They would be chopped up into a library and given tags to identify them, so when the next episode comes in, I can do the first pass on it. Rather than it going immediately to Guy, I would use the music that’s already in the library to build a functional score, thus saving Guy time writing for the shows. In my specific case, I also do some of the writing, mostly just filling gaps between cues to make sure everything runs together smoothly. In this type of application, it’s the music editors job to try and take as much off of the composers shoulders as possible. When a composer gets a project, it’s quite easy (because of their unique compositional style) to remain identifiably ‘them’. How do you go about, as a music editor, achieving the same result? Because the music in the library is written by Guy anyway, it’s pretty easy to sound like him when I just do straight edits. However, as I said before, I end up writing for a lot of the projects we work on as well, which is where this does become a challenge. I’m fortunate that I find it quite straight forward to emulate Guy after working with him for so long, but it’s certainly a skill I’ve had to work on over the years, and for music editors that do any writing is an integral skill to work on. The spotting is really where it can come down to personal preference. I may read a scene differently to how guy reads it, and that can be a problem because consistency in sound is one thing, consistency in placement is a completely different kettle of fish. To combat this we often sit down and spot it together, especially at the beginning of a series. I’ll then go through the whole episode myself and, once I’m finished, we’ll sit down to go through it and change or amend anything then. So in terms of consistent sound, really the main hurdle is spotting more than anything else. Is there ever a point when you’re working that you start to think “this is all sounding a bit repetitive”? How do you get past that? Yeah all the time actually, and it is quite difficult to navigate through this minefield! When you’re working with a limited library there’s only a certain amount of cues you’re able to pick, and sometimes the same piece of music can be just as appropriate for a scene as it was in the last episode. You end up having to fight all your natural instincts to reuse the same music to make sure your keep some variety in the show. I should add that that’s mainly true for action music, for smaller cues – emotive ones or small stings here and there – if it’s used multiple times in an episode it doesn’t necessarily get noticed, but you do have to be careful. Using the same brass swell in two episodes, as long as they don’t come from the same cue and go into the same cue, are usually things you can get away with. Sometimes a cue can go on for too long. If a cue is 15 seconds long and the scene you want to use it in is 30 seconds long, you initial reflex is to copy and paste it to make it longer. Job done! However it’s rarely that easy. When you do that the music can become tiresome and boring. If it was written as a 15 second piece then it should be used as such or be cut down, if you then extend it you’ve got to add variation otherwise it just becomes a chore to listen to and is noticeably unchanging. We know how composers usually write with templates, reverbs etc. how does it work for music editors? Do you have a template? What’s your workflow? Like most composers and music editors of any sort, I have a template. It’s not a traditional template though, it’s nothing like Guy’s template of 1000+ tracks! I do have a marker track so I can mark hit points, a tempo track so I can accurately match the tempo of the different cues, I have a signature track for the same reason, it’s much the same as a traditional template in that sort of respect I guess. The difference is primarily that I almost exclusively work with audio tracks. We deliver 7 stems generally; Live cues (from recording sessions), Brass, Strings, Woodwind, Percussion, Synths, and Guitars. For each of those 7 stems I have 4 audio tracks to use for editing, so I will have… what’s 7 x 4… 28 tracks in total! I do this so I can layer things on top of each other, which helps in the delivery if a cue if made up of multiple stems (which they almost all invariably are!). In terms of techniques, I have a reverb for each of those stem groups that I use to help me sculpt the audio, and I primarily use it to smooth over the ends of cues. For example if I need to cut anything short, say a string legato line, I can usually cut it short and add a small fade, then increase the reverb towards the end to create a nice natural tail. The goal is always to make it sound as natural as possible, if it sounds artificial or ‘janky’ in any way, then it doesn’t work. I cross-fade cues quite a bit as well, if the two pieces are in the same key on hanging on the same note it generally works better, then add a bit of reverb as it cross-fades to smooth the transition. It doesn’t work 100% of the time, and can take a lot of trial and error, but sometimes it works brilliantly (almost as if they were the same cue). I would necessarily call it a technique as such, but it’s something that’s always handy if the regular cues just won’t gel as-is. How do you know when an edit is finished? Very good question. It’s difficult to tell sometimes. I always try and take a step back when I think I’ve finished and scrutinise every scene from start to finish. For example with the 20 minute episodes we’ve been working on at the moment for Netflix, when you’ve been editing for 2 or 3 days solid, it’s easy to lose sight of whether something really works. You need to be quite harsh with yourself and really nitpick everything, and if one thing doesn’t work ask yourself “can I fix that, or will it overhaul of the whole scene?”. Irritatingly (and sometimes dishearteningly) if that answer is yes, it does need to be trashed and re-edited. The main question you should ask yourself when you “finish” an edit on a scene is: “does the sound like it has been originally composed?” If the answer is yes then happy days, you’re done! If the answer is no, then you need to start the cycle again. You’re not supposed to know a music editor has ever touched a score. We work in the shadows I suppose, kinda like Batman! You know when an music editor has done his job properly when you don’t know that a music editor has even worked on the project, that’s the bottom line. Why would anyone choose to hire a music editor? Alleviating time pressure would be the first and foremost. We currently have 3 shows on the go, plus other projects, so when you have all that going on at the same time, I’m sure you can understand that sometimes there just aren’t enough hours in the day to write everything from scratch. With a music editor on hand to cut up all your music and do all the first passes on everything, you can get things done so much quicker. 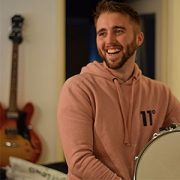 An original composition for a 20 minute TV show, depending on the amount of music needed, could take anywhere between 3-7 days to finish (depending on your output and productivity of course). That’s quite a bit of time, so if you have more than one show/project going it would start to become unwieldy to do it alone. An edit typically takes me 3 to 4 8-hour days, but that’s 3 to 4 days Guy can be working on something else. Another benefit would be consistency of sound. Sometimes composers quit or leave a project a few episodes in, they might get fired, there are any number of different scenarios in which a composer can no longer work on a show or project. If you’ve got a wealth of music that you can contractually use for the reminder of the season, you could hire a music editor to recycle the existing music for the remainder of the project. That’s not something I see very often, but It’s certainly a moment when a music editor’s talents would come in handy, at least in the short term if nothing else. How creative do you get to be working as a Music Editor? It can be very creative. As I said before, I write a fair bit of music that makes its way into the projects we work on. Even though you are writing in someone else’s style, it’s still an opportunity to write something new and fresh, so it’s very creative in that respect. If we’re talking purely about the editing, it’s more creative than people might think. Think of it like this: With a jigsaw puzzle, the picture is pre-defined, the pieces fit into their expected place, so you already know what the end product is going to look like. A lot of people assume that this is what it’s like to edit a show – formulaic. I think of music editing more like having a jigsaw puzzle where each piece can have multiple places to fit, some work better than others, but ultimately it comes together to create a completely different image consisting of the same elements that are on the box. The possibilities can be endless. How did you get into it music editing? Is it something you aspired to be along with being a composer? I kind of fell into it to be honest, it was not a route I had expected to take! I started working for Guy in 2013, fresh out of university. I started off as a bright-eyed admin assistant and eventually, through perseverance, I ended up editing on a Jungle Book series we were working on. When I first started doing the episodes, not a lot of my stuff was getting into the final product, I was working with new equipment I’d never used before and I wasn’t 100% familiar with the show. Eventually I got more and more of my edits into the delivered episodes and my skills developed more and more and I proved myself valuable to the process. I was always actively enthusiastic about the shows Guy was working on, particularly the Marvel ones (being a Marvel fan myself), and was keen to offer my opinion on cues and sequences when asked or in passing. Because I was enthusiastic about everything we were working on, my willingness and determination to get it as perfect as I could, and learning to work to tight deadlines, I was asked to do more music work and trusted with more and more. I feel like I learned a lot ‘on the job’ and I feel like that’s the best thing I could have done, sometimes you just have to get out there and do it, even if it means making tea and answering emails for months or even years first! 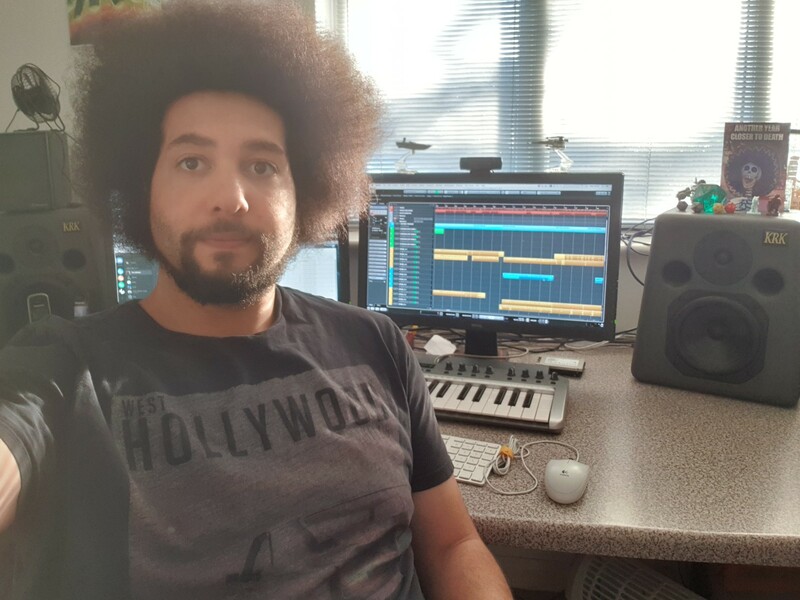 What fundamental skills do you need as a music editor? Leaving out the obviously musical ability you need, I’d say the ability to spot a movie/film is paramount I think. You need to know when a scene needs music and when it doesn’t, what style or mood of music is needed when, when to transition to different moods/styles, when to use character cues, and so much more. There are definitely aspects of this that are show/production-specific, but a general awareness of spotting is definitely important. Time management is key as well. Doing action scenes and things that require lots of percussion or have lots of twists and turns should always be prioritised. They are usually the hardest bits to write from scratch, so if you only managed to get those done the composer would only need to write the little bits of connective underscore music (which is usually pretty quick). Beyond that is general musicianship I mentioned before and a proficiency in navigating and learning new technology and software. To know, or be able to learn quickly, the gear you’re working with. For example, you have to learn to replicate your workflow in a different DAW, you might have to learn to use Macs instead of PCs (like I did), you might be asked to deliver stems in specific ways with little to no guidance, the list is endless! The better you are with the tech to begin with, the more advantageous position you’ll be in.